How can I start my home daycare? 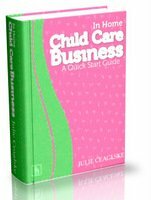 I wrote the book for women like you that want to become child care providers and get a quick start at it… as well as the RIGHT START. It’s a fast read filled with valuable information on methods and techniques that work the first time. I also go into great detail on advertising yourself. I suggest you try this first before you go to the hard work, expense, and hours of building a website to advertise yourself. Comments for How can I start my home daycare?